This resort caters to all. Choose the internal or external lagoon to stay in a magnificent bungalow. Renew your vows in a little chapel with a stunning view of Mt. Otemanu. Learn about the ecosystem and underwater life in their interactive center. Take the time to visit the turtle sanctuary where endless efforts are put into the rehabilitation of sea turtles. Welcome and “Ia Orana” to Le Méridien Bora Bora…Completely renovated in a contemporary and elegant design, this luxury resort is set on a magnificent islet surrounded by the most beautiful lagoon in the world and offers stunning sights over Mount “Otemanu”. 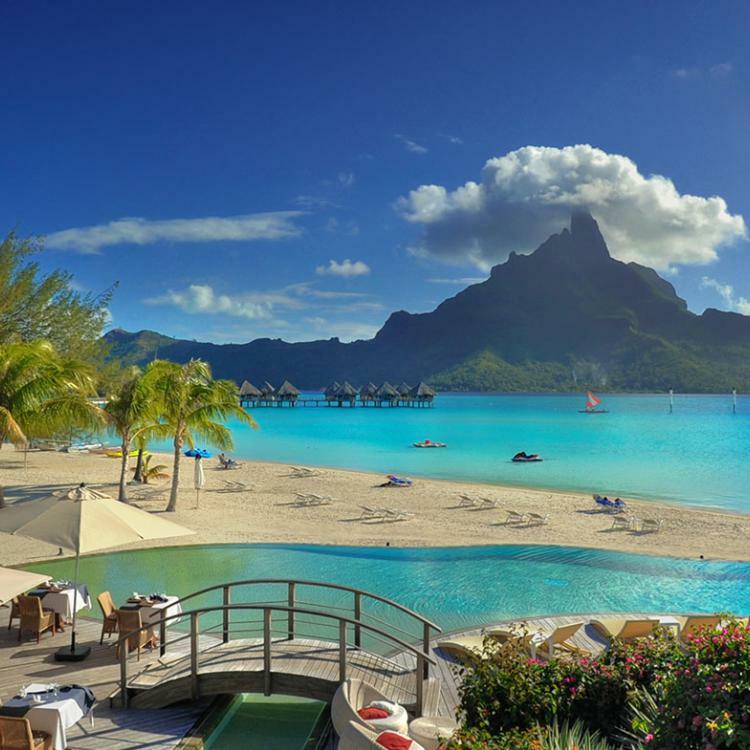 Bora Bora is a small island thick with coconut forests and colorful villages, surrounded by miles of fine, white sandy beaches and crystal clear, turquoise water as far as the eye can see. Don’t just dream about paradise, come and enjoy it for yourself in one of our overwater bungalows. Discover the home of numerous marine turtles at the Bora Bora Turtle Center. Overlooking Mount Otemanu and Bora Bora lagoon, this chic island resort is 2 km from the Yacht Club and 8 km from Matira Point. Thatched-roof bungalows offer stylish decor and lagoon-view terraces, as well as Wi-Fi (fee), flat-screen TVs, and tea and coffeemaking facilities. Over-water bungalows have glass floors. Villas sleep up to 8 and offer plunge pools. Free breakfast is served in an airy restaurant by the lagoon. Additional dining options consist of a beach restaurant, a Mediterranean restaurant and an open-air bar. Other amenities include a wellness center, an infinity pool and a turtle center. Scuba diving is available for a fee.